"Twice the Fun, Double the Trouble." Lindsay Lohan plays in this exciting film of twin girls who are separated, meeting at summer camp. The two girls, Hallie Parker and Annie James cannot stand each other. They play pranks on each other and are very mischievous. After finally destroying a bunk room they are sentenced to remain the rest of their time in a cabin, just the two of them. The idea of it makes the girls completely upset but when they finally realize that they are twins and they have the same parents, their feelings towards another changes altogether. Hallie lives in California on a vineyard with her father, Nick Parker. She seems to have the life at her father's house. She has a dog, beautiful horse, and Chessy who works for her father to take care of Hallie. On the other hand, Annie lives with her mother in England, Elizabeth James. Elizabeth works to design wedding dresses. Annie's house is big also and she too has life pretty nice. She has fine dining, her grandfather, the butler and a very lovely house. The two girls while at summer camp transform themselves to look, sound and act like the other. The ultimate plan in the end, is to get their parents back together. Nick is about to marry some horrid woman who Annie and Hallie cannot stand. When the four go on their back-to-school summer camping trip, things really hit it off when Annie and Hallie prank the soon to be bride. Things such as placing her air mattress in the lake in the middle of the night and a lizard on her bottle of water, may seem funny to Annie and Hallie, but they are certainly not amusing their father or the soon to be bride, Meredith. Meredith has clearly had enough and she is at the end of her wits. She makes Nick choose between her or the girls and Nick chooses his girls. Meredith all in a huff and puff screams and throws the ring at Nick. Nick drives home from the camping trip with his two girls and no more bride. Shocked at the early arrival, Elizabeth can only chuckle at the events that has taken place. Even though the girls have been grounded, it was worth it in the end. The rest of the movie plays out as a fairy tale in this fun family-filled movie. 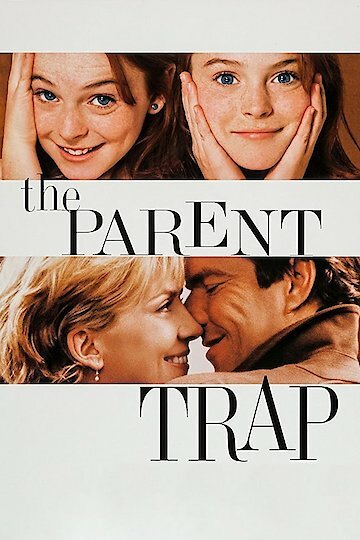 The Parent Trap is currently available to watch and stream, buy on demand at Amazon, Vudu, Google Play, FandangoNow, iTunes, YouTube VOD online.